Hey all! It's Kady from Teacher Trap and I've got math on the brain today! 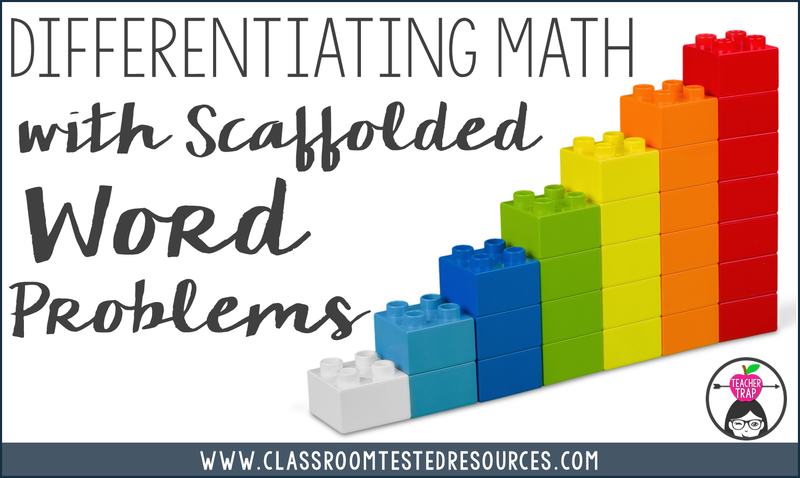 I thought I'd share one of my favorite (and one of the easiest) ways to differentiate in math. I call them "Scaffolded Word Problems" although I'm almost positive "scaffolded" isn't a real word. :) Regardless, that's what they are! 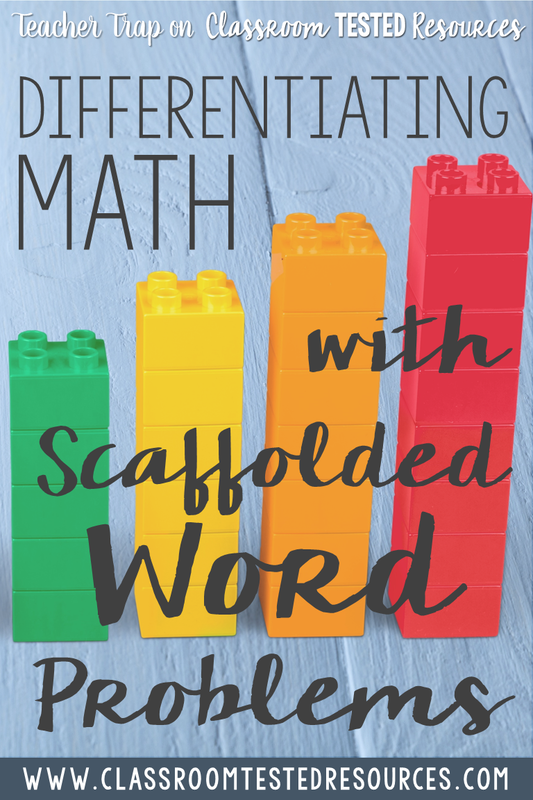 Creating scaffolded word problems is SIMPLE! It's a lot like backwards instructional design. Start with where you want students to end up, and work your way backwards to where they are now. With math problems, it's especially easy because you can just adjust the NUMBERS and simply the WORDS! Many students are intimidated by BIG numbers, but if you start with friendly numbers, kids can focus on the process in the word problem, rather than the computation. Once they understand the process, building up to bigger numbers is easy. Meg sold 435 raffle tickets. Carlos sold 392. How many more raffle tickets did Meg sell than Carlos? When my students read a problem like this, they are often overwhelmed by the large numbers and confused by the way the question is worded. SO, I scaffold the problem by taking out one of those challenges. Meg sold 15 raffle tickets. Carlos sold 10. How many more raffle tickets did Meg sell than Carlos? Meg sold 56 raffle tickets. Carlos sold 45. How many more raffle tickets did Meg sell than Carlos? Students recognize that this is just another comparison problem! We are simply subtracting but with larger numbers. And once they've mastered this, I can head back to my original problem because students are primed for success! Here's an example with another tricky problem type. My students always struggle with "part unknown" subtraction problems. In these problems, you know the total and one of the parts, but the other part is a mystery. Students often want to add because these sound like addition problems, but to solve the problem, you need to subtract. That's why we start simple and work our way up! 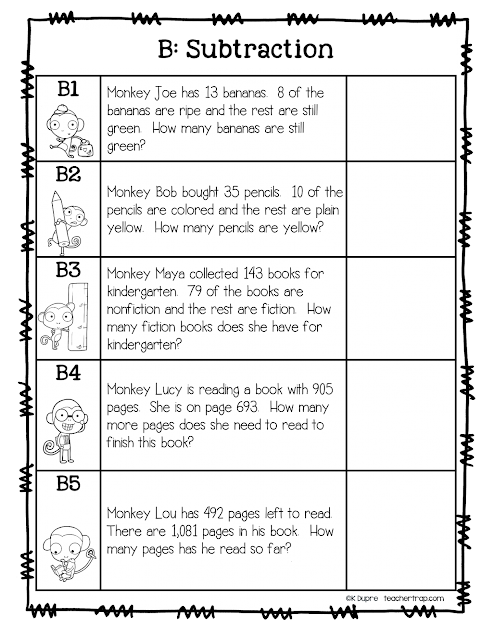 I created a pack of scaffolded word problems for my students and below you can see the subtraction page from the Monkeys Set. You'll notice that even though the first problem is the same type of word problem, it is quite a bit easier! Students make sense of the first problem, name the type, and get the hang of it before moving up to more challenging computation. The best part about this strategy is that you can easily adapt problems to meet the needs of different levels of learners. If you use Guided Math, for example, you simply choose your target word problem, and adjust the numbers.